In true road warrior style, they have learned their chops on tour and have been relentlessly tearing through shows, and have already opened for the mighty Gun’s n Roses, Slash, Alice in Chains, ZZ Top, Buckcherry, Rival Sons, and Vista Chino over the last 2 years and are ready to show the Nickelback fans how hard-rocking they can be. I had the opportunity to chat with guitarist Jeremy Widerman while the band were in the middle of the tour. I opened by asking him how the dates with Nickelback were going. It’s been going great; we are playing to thousands of people every night. It seems an unusual musical pairing to me, personally? I don’t know, I think that people would be divided on that opinion. I could certainly see how some people might see it that way but there is a whole other consensus of people that see it as a great fit. You also played a date in London a few months ago-with Janes Addiction so you certainly like to mix it up in terms of what bands Monster Truck play with. Do you feel that the band enjoy challenging people’s perceptions? I don’t really know; I don’t know what people’s perceptions are of us. We have played with a lot of bands. Janes Addiction was only one show. It’s hard to change a lot of people’s perceptions just on the one show. We have toured with Anvil, in Canada, Europe and North America. From metal to classic rock. Right through to whatever you want to classify Nickelback as. It all helps us to come back and do our own shows. At the end of the day that is what it is all about-our own concerts and getting our own fan base for the hour and a half show. You are now working with and signed to Mascot Recordings. How has that relationship developed and worked for Monster Truck? It has a really great hold on how to expose bands in these markets which is something that we struggled with previously. They have all the contacts with the right magazines, and all the people that we are hoping to get interviews with. We can expose the band to their readers and their internet traffic. They are just really good at knowing all the right people and giving us the right support when we are out on the road and allow us to keep touring. Just taking you back to when you discovered music for the first time – can you recall your first musical memory? I have really good memories of the riff of “Surfin’ USA” by the Beach Boys. It was just the first song that I got really excited about even though I was only about five years old. It was the tune that kind of helped my parents direct me into other rock and roll music that came out of the fifties and sixties. That then led me to the classic rock era eventually. When that initial seed took root and the band first started out, was it difficult initially to get established in Canada before taking on the rest of the world? What was the musical market like then for a new rock band taking its first steps? In the beginning, the band were not trying to do anything just to have fun. It was really a side project that we would do and maybe just play a show once a month. Just to get drunk and it would turn into a party and it wouldn’t be anything too serious. Because we started out like that I think that it caught on really quickly as people can tell when you are being honest and very obviously doing something just for the fun of it. It becomes really attractive to people who come to the shows and are interested in the music. The bigger story for us was really transitioning from that mentality into actually get a van, go back on tour and do the whole thing. I think that a lot of times we were in other bands where you listen to them and inevitably you are disappointed when it doesn’t happen for them. We started really slowly with this band and because of that we didn’t expect too much from it. The Nickelback tour is due to hit the UK shortly, what happens after that for Monster Truck? Will you have a break and then go out and do your own headlining tour? We are going to go home for a couple of weeks, and I think that the plan is then to try to come back to Europe. We will be playing Germany again and there is something that we are working on that we will be announcing soon. You mentioned that you will be having a few weeks off. How do you generally spend that time? Do you have any spare time interests or pursuits outside music? Naturally being from Canada we are all massive hockey fans. We have been trying to pay as close attention to the World Cup of hockey as possible. We are also getting excited for the upcoming NFL season. The beautiful part of being home you know is of course just getting to spend time and see your friends and family. It’s time well spent being with them. Personality-wise, what sort of person would you be? – an optimist or a pessimist? I think if you ask everyone who knows me that they would say that I am a pessimist. I feel more like a realist, and see what things actually are. One of the things about the band is that everyone has a different take on that. Some of the other guys in the group tend to balance me out. Outside of what you do with Monster Truck do you like any different musical styles and genres? I love the answer that I don’t feel guilty about listening to anything that I like. I think what you are really asking is for something outside the box. You are expecting something different, and that is an easy kind of answer. It’s an artist called Agnes Obel. I don’t know really how to describe her. She is kind of a singer-songwriter and it is very softer. I absolutely adore her. Pros and cons of being a working musician in the current musical climate of 2016? The pros are almost like they always are minus the crazy money and parties and stuff. We tend to work pretty hard and so don’t have as much time for letting loose. The pros are being on top of the world, meeting a ton of great people and playing amazing shows, sharing the music to the world. That is something that I think everyone thinks is awesome when you are in it or looking at it from the outside. The cons are what I touched on earlier being away from home from family and friends. You know it’s not a safe profession. Being on the road all the time and in the air all the time. You start to go a little bit crazy with the schedule and the constant moving all the time. At the end of the day it’s all about whether it’s worth it to you and the best part about our band is that we have found three other people that are willing to be crazy with and deal with the cons because the pros are so good. Do bands these days have to be more astute business-wise as it’s become more difficult to generate an income from music? I think it’s critical now, it’s become more important ten years ago and now it’s become paramount. Sometimes and I think that you have seen it throughout the industry where the business end becomes more important than the music. That is when some others go in the wrong direction. For us it’s always been about keeping a really firm grasp on both. It’s being really responsible from the music end which is constantly practicing, playing, and writing-never really taking your foot off the gas, as far as trying to be creative. At the same time trying to have a firm hand at what is happening at the back end whether its logistically or financially. There is someone in our group looking after one of those angles at all times. In the band everyone has their different categories and keeping an eye on things. You know whether is social media or the accounting or even where we are going to spend our days off so that we are not sitting in a hotel parking lot. You will start to lose your mind with mistakes like that. I am happy to say that everyone does their part to help things run smoothly. Just to wrap up, I’m sure that you have done many interviews. Who would you actually like to sit down and interview? You know I would love to sit down with Mark Farner of Grand Funk Railroad. 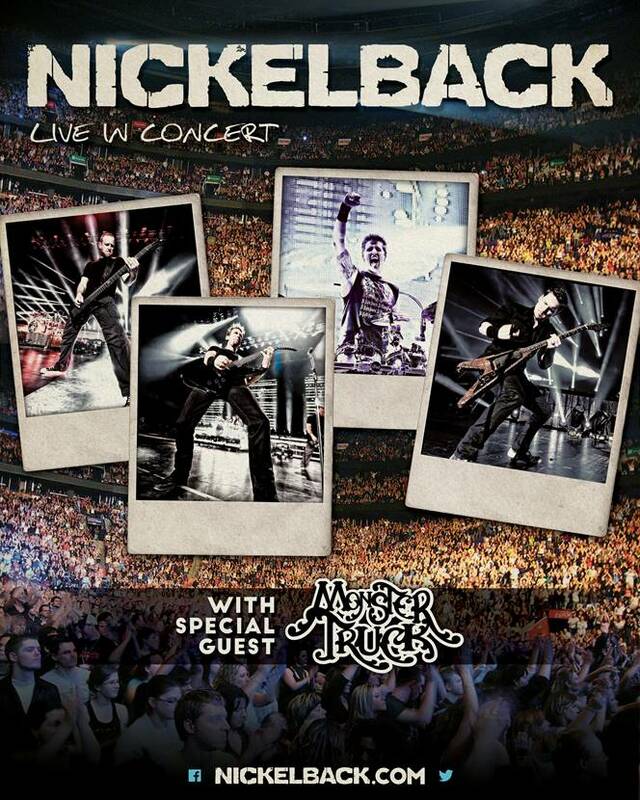 The Nickelback tour will be hitting the UK soon; will Monster Truck be returning to play their own tour in the UK? That is something that we are always very keen to do after an opening slot like this. When we get an opportunity to play in front of a ton of new people we always try to follow it up with a headline tour. We will be releasing some information on that as soon as we can.